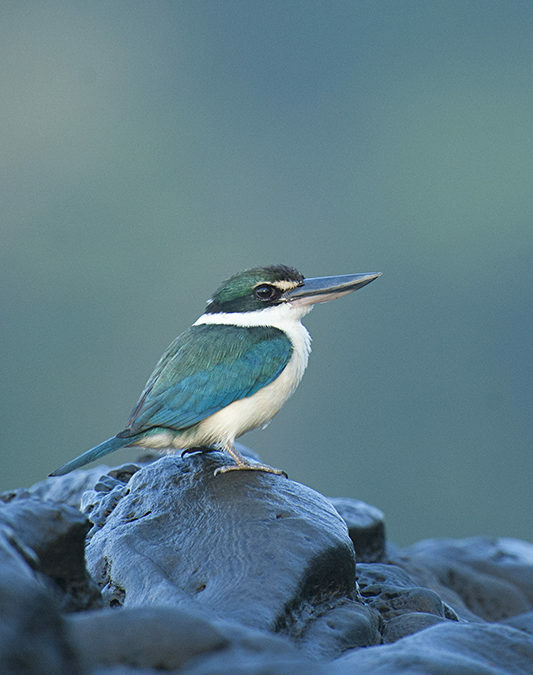 After my first photo session with the Collared Kingfisher, I fell in love with the small wonder and I was actively looking for it whenever I was on the beach. And this evening on Neil’s Cove I spotted one sitting on a rock by the water’s edge. Given that these rocks are sharp and slippery, I carefully ventured closer to my subject. When I was relatively close, I took my first pictures (below) of this Collared Kingfisher with the ocean as the backdrop. 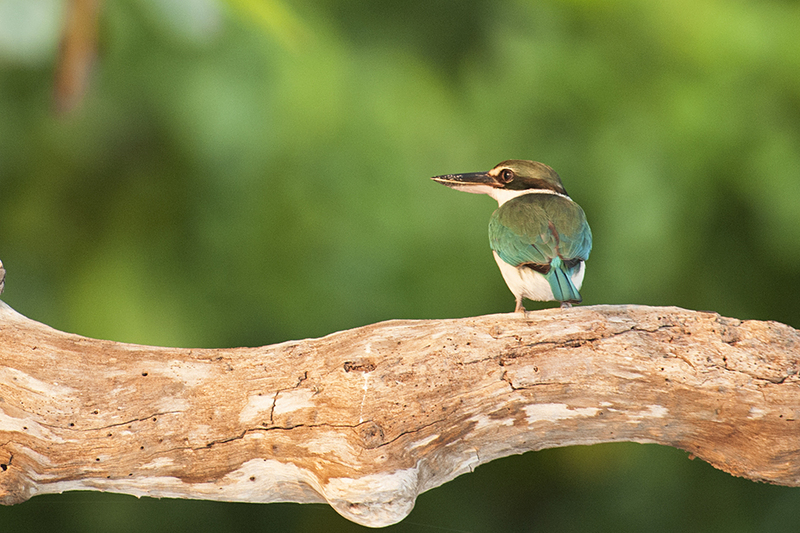 I then ventured a little closer and the Collared Kingfisher looked at the approaching threat (me). I immediately froze on the rocks and got this picture (above). 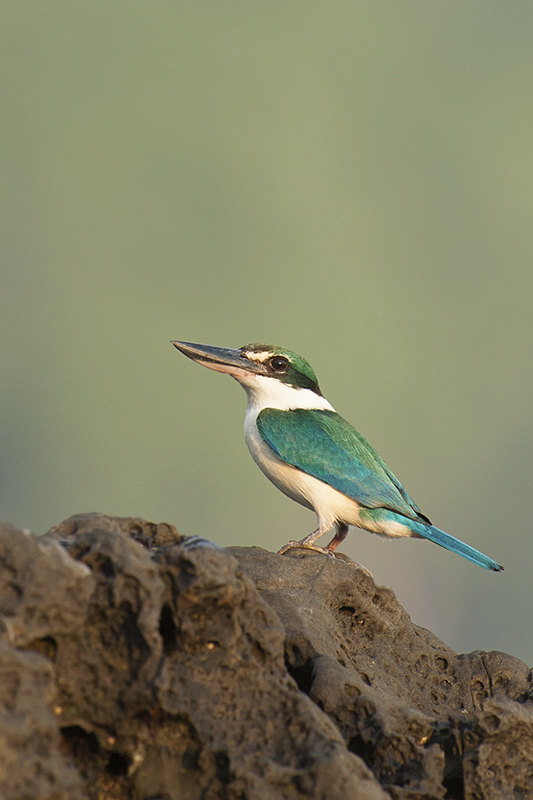 While I waited for the little guy to get used to my presence, I looked around and spotted another Collared Kingfisher not far away perched closer to the beach. I once again slowly felt my way through the rocks and took this picture of the other subject with the trees as the backdrop. By then the first Collared Kingfisher had flown farther away from me. The sun was fast setting and it looked like it was time for the small fellow to roost for the evening. 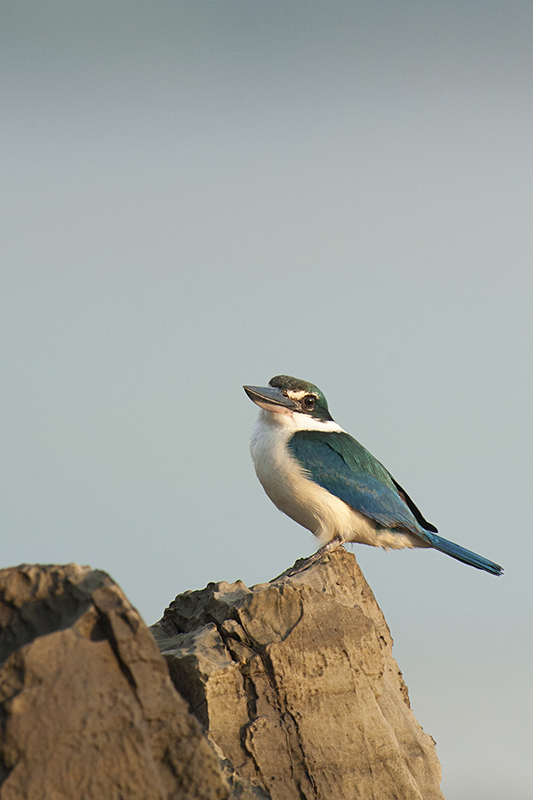 In preparation of roosting, the Collared Kingfisher flew and sat on a low branch of a tree lining the beach. The evening sun was casting a golden hue on the Kingfisher and I captured the glorious scene (above). The tolerance of this species to human beings amazed me and I signed off for the day reminding myself to come again in the morning and get some more pictures in the cool morning light. 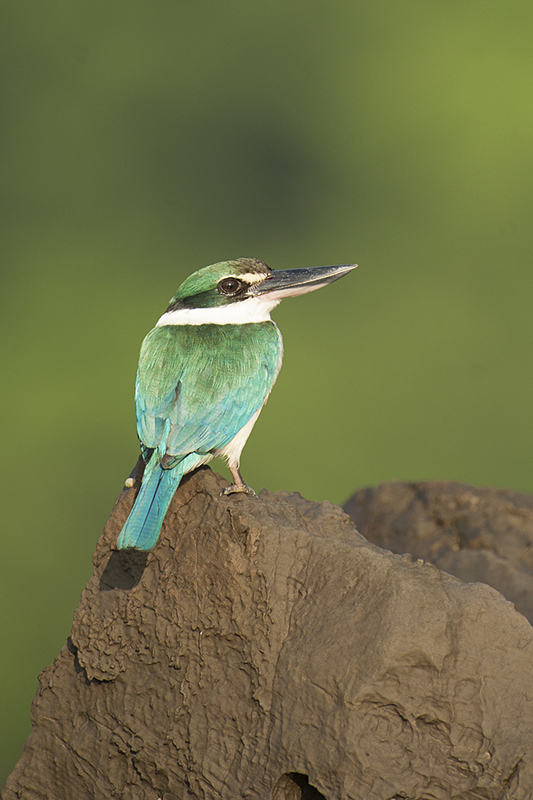 And luckily for me, the next morning, the light was amazing and I did spot one Collared Kingfisher sitting on the rocks not far from the beach. 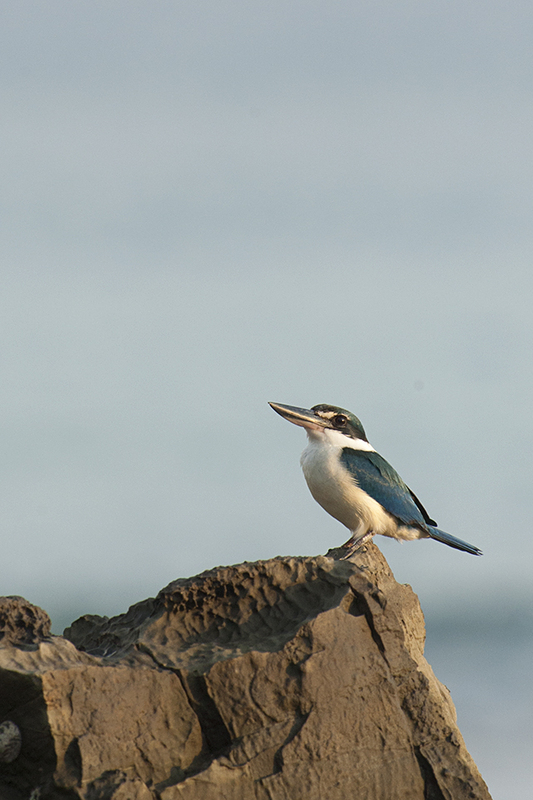 I was very clear about the composition and backdrop for this picture and I slowly walked around and got in between the Kingfisher and the Ocean. This way I had the beach and more importantly the treeline as the backdrop and I took the picture of the Collared Kingfisher in the soft morning light. I made that the feature image (first image) of this post. As the light got brighter, I took another series of images of the Collared Kingfisher, my last pictures on this trip of this amazing bird. I then let the bird go about its business of finding its breakfast and I went in search of the Stork-billed Kingfisher.